The Week in HD - Monday 1st October | What Hi-Fi? Welcome back the The Week in HD - a guide to all the best high definition TV shows, films and sports to grace your screens this week. 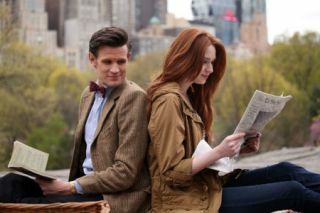 And there it was - us Doctor Who fans said our last farewell to the Ponds on Saturday night, and it was both heartbreaking and somehow a happy ending. Highlights from all three days of the 39th Ryder Cup. And after what happened last night, that has to be worth watching. Gotta love Red Bull’s involvement with motorsports. If they’re not winning the Formula 1 championships, they’re putting on breathtaking shows such as the world’s best freestyle motocross riders showcases all their tricks and stunts across the globe. Tonight: Dubai. As a 90s child, last week’s quiz was a great blast from the past (both the 90s and the 80s quizzes are still on 4OD if you want to catch up! ), so here’s the last of the series - with the panelists including David Mitchell, Kevin Bridges, Richard Ayoade, and Noel Fielding. It’s the quarter finals, and biscuits is the theme of the day. There’s signature crispbreads and the technically challenging chocolate tea cakes, but the it’s the gingerbread house showstopper that we’re all really looking forward to. Heartbreak Hotel. Castle & co head off to investigate a murder in a casino in Atlantic City...but who says they can’t also have a little fun while they’re there? I do love me some sleight of hand, illusions, magic, or what you will. Here’s some great tricks from street magician Dynamo, including a Matrix-style levitation. An ambiguous and atmospheric story of a young couple, Dawn and David, who return to David’s old family home in the Fens to start a new life - but their seemingly idyllic lives are disrupted by the arrival of David’s troubled younger brother, who exposes the lies in their relationships. One of the highlights of last year’s BFI London Film Festival, this indie film boasts powerful performances by Claire Foy, Benedict Cumberbatch and Shaun Evans. New series, as part of BBC’s Original Drama line up. A betrayed agent trying to figure out who set her up might sound like a tried and tested storyline, but a quick look at the credits and it’s a bit more exciting - this show is brought to you by the people behind The X Files and Spooks. I miss Spooks terribly, so I’ll take it. Melissa George (evil Lauren from Alias) stars as Sam Hunter, a private intelligence agent who travels back to London undercover to investigate which of her colleagues tried to kill her. Expect lots of action scenes. It’s been a while since Ross has had a great line-up on his show, but tonight we’ve got comedian Jack Dee, street magician Dynamo, actress Emma Watson, but more importantly – No Doubt are back together and they’re performing singles from their new album Push and Shove. Jack and Jill. Stephen Fry and Alan Davies are joined by Sarah Millican, David Mitchell and Sue Perkins to talk about names starting with J.
Arthur’s Bane, Part 1. It’s ridiculous and silly but oh so much fun. Merlin’s back and even darker forces and Morgana are hell bent on destroying the newly-crowned King Arthur and his kingdom. Let’s hope Arthur finally notices that Merlin’s a wizard. Also, dragons. Arena presents a double-bill of a documentary full of rare Beatles archive and the film conceived and directed by one of the world’s greatest bands. Martin Brundle and co bring you live coverage from the spectacular and always-eventful Suzuka International Racing Course with its iconic figure-of-eight circuit - trust me, the crazy early start will be worth it. Branson’s political views continue to be a sore point in the household, which leaves Sybil rather uncomfortably in the middle, and having to take sides. Downstairs, Ethel must make a difficult decision regarding her son. It’s Freddie’s birthday, but he’s disappeared amidst two huge breaking news stories, so it’s up to Hector to take charge. Elsewhere, Thomas Kish’s death has left everyone reeling. Hosted by Myleene Klass from the Royal Albert Hall, the night’s celebrations will feature Andrea Bocelli, Russel Watson, Nicole Benedetti, Gary Barlow, Andrew Lloyd Webber, the Military Wives and the cast of The Phantom of the Opera, with the Lifetime Achievement awarded to composer John Williams.